On notification from fellow Seibertronian Stuartmaximus, we went to find the source of some new information about the upcoming Super Bowl (this Sunday 5th February) and the rumoured Paramount slots during the adverts. According to Deadline, again, Transformers: The Last Knight is most definitely planned to be shown during the 'game'! How different will it be from what we've seen already? Will it interest enough to warrant watching the latest instalment in the live-action franchise? Let us know in the Energon Pub, before, during and after the new clip emerges! PREVIOUS: Word is leaking out about which movies will claim TV spots during the Super Bowl on Sunday. Paramount will run a Transformers: The Last Knight trailer during the game, while its anime adaptation Ghost in the Shell starring Scarlett Johansson will have a spot before kickoff. It should be Sunday, February 5th. All the super bowl trailers have had new footage. 2007, Dotm like TLK had trailers before the superbowl spot and they had new footage so I don't see why this super bowl would not. I don't think paramount would try to get an ad for the movie in the Superbowl if it was just going to be the first trailer in a different order plus they have already had two spots on youtube that did that and i don't see a third one doing the same. SnoopDawg wrote: It should be Sunday, February 5th. Yep, 5th February it is! You know despite what some people say about the movies seeing this screenshot once again reminds me about how fantastic the cgi is with the exception of AOE which was good but not amazing. If the first trailer and this screenshot says anything it's that the CGI is going to be great in this movie. I'm actually really excited to see this film in a few months especially since most of the details are still kept secret and we haven't seen major leaks like the Sentinel Prime is evil and kills Ironhide leak disaster from DOTM which spoiled a bit of the movie for me. Deadput wrote: You know despite what some people say about the movies seeing this screenshot once again reminds me about how fantastic the cgi is with the exception of AOE which was good but not amazing. AOE had the best CG. I would like to argue and say that DOTM had the best Cgi but seriously AOE had some of the worst when it came to the new designs it felt less real and was super fake looking at times. Only times I thought it looked great were when they were using the old designs or designs that were less streamlined and smooth like with Ratchets death, Prime and Bee's evasion forms, any of the KSI Transformers besides Galvatron. I like the designs for the main AOE cast and Lockdown but they did not look that real on the screen compared to DOTM since they were all super shiny and stuff and it was like with Tarkin and Leia in Rogue one where its not bad but you can tell its fake. It's your opinion though so if you think its the best good for you but I'm just saying my opinion that AOE's Cgi effects were meh. Bay said the trailer is dropping at 6AM. No idea what time zone he's talking about, but I'm definitely staying up until it drops. It feels like Christmas Eve. We try to sleep sometimes, too, yes. You know, lives. We remind all users that the best way to help us out is by submitting news via the channels that alert us to a notification - like sending an email to news staff or using the 'submit news' form! Staff has to keep an eye on the boards and on all the possible social media platforms; things can get missed, especially at busy times. 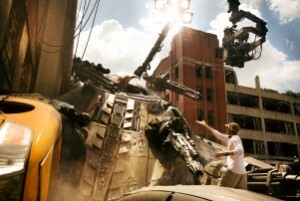 Via a number of notifications from fellow Seibetronians, we have two new pieces of news rolled in one regarding Michael Bay and his latest project with Paramount - Transformers: The Last Knight. According to the director himself, the new trailer, the one that will air during the Super Bowl, will make its appearance at 6 am (speculating Central Time, but we may not be correct on that), and then again after it airs at the event, with an extended chunk of material. Funny? coz previous posts of mine that made the front page weren't first submitted that way! it just goes to show that when it comes to the front page, that this website plays second fiddle to the likes of TFW2005 ect...when breaking SOME news items. Sorry if this is offtopic but the Forums button on the main website says it's an error? Stuartmaximus wrote: Funny? coz previous posts of mine that made the front page weren't first submitted that way! As I said, some things can slip. That doesn't mean all of them, just some of them. Does that make sense? Some is not all. Just some. We're glad to have you here to help us, by the way! Hope you enjoy the community. A couple of additional details concerning the new Super Bowl spot for Transformers: The Last Knight, coming from various corners of the internet. From the official Facebook page, we have a longer version of the synopsis for the movie, and a reminder of the new spot with the new image of Optimus Prime's face. The admin for Michael Bay's website has posted that the spot itself will air in the 2nd quarter, 2nd commercial break (somewhere around 7:30pm EST). As a reminder, the spot we will see today is shorter (30 seconds) than the one revealed at the event itself (55 seconds). And finally, it appears that the spot initially timeslotted for 6 am in some timezone, may actually be confirmed for 9 am PST. Keep your optics tuned, whatever the case, as we will bring you news as it breaks here on Seibertron.com! Can he please just keep his friggin word and leave the franchise so these movies MAY actually be able to get someone GOOD making them. Galactic Prime wrote: Can he please just keep his friggin word and leave the franchise so these movies MAY actually be able to get someone GOOD making them. Good is a subjective opinion there is no universal answer to who is the best choice and you know why? Because there is no best choice that's how life works there is no perfect choice or ways to do things Bay leaving the movies isn't going to magically make them amazing and there is all the other people who work on the movies like producers and screen writers. What would you do to make the movies "better" more robot screen time, no humans in a human made franchise?